Upfront Disclaimer: I originally decided to read Daniel Carlat’s Unhinged: The Trouble with Psychiatry — A Doctor’s Revelation about a Profession in Crisis as the logical followup to Whitaker’s Anatomy of an Epidemic: Magic Bullets, Psychiatric Drugs, and the Astonishing Rise of Mental Illness in America. Thus, it’s almost impossible for me to think about this book without comparing it to the Whitaker (the Reading Responses for which are here, here, and here). All that being said, I’ll do my best. Carlat’s Unhinged is an amazingly fast read, mostly because it’s written the way a person would speak. This works for the book, because at its core it’s a first-person account of realizing that what you do for a living may be just a little mediocre (and sometimes unethical) in the grand “Am I doing all I could be doing with my training and for my patients?” scheme of things. The major takeaway for me was less about having learned something new about the god-awful practices of the pharmaceutical industry and less about the solutions he’s offered in his concluding chapter. 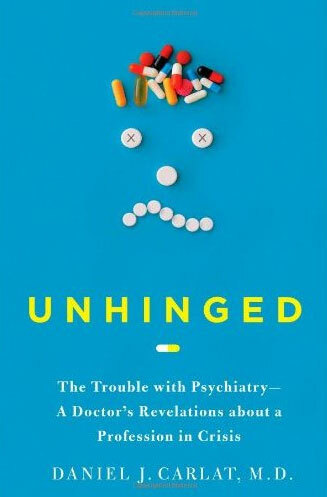 The takeaway point that made reading it worth it was NOT that “sadly, psychiatry itself has become unhinged, fractured by scandals, by debates, and by the skepticism of an increasingly informed public” (186). Instead, it was a very specific form of audacity within the psychiatric field. Carlat is not audacious. (For that matter, neither is my psychiatrist who practices with talk therapy and meets with me for an hour.) But given the broad-brush description I’ve just finished reading, I’m wondering at what point a profession may put its ego aside and realize that what they know of the brain is minimal and what they know of the mind is less. And although Carlat doesn’t come out and point-blank say it for me, it’s always refreshing to hear the honest “I don’t know.” Through the years I’ve seen my fair share of doctors who seem incapable of admitting what they do not know. With every rule comes its exceptions, but right now I’m beginning to wonder To what extent are we (the patients) complicit in allowing a profession we rely on to work toward its own self-preservation even if or when that need for validation conflicts with our best treatment? So, here: Regardless of your chosen or recommended treatment methods, how many questions do you ask of your mental health professionals? How many questions do you ask of their responses? What kinds of answers to do you receive? To what extent are you satisfied with those answers? My thinking here is that when we are sick in some other way, we ask our doctors a lot of questions. We get second opinions. We talk about alternative treatments. We ask all kinds of questions regarding what to expect from our treatments. We know the histories of the medications available. We know the histories of our doctors (e.g., the number of patients they’ve seen with similar conditions). After a few months of running this forum, I’ve been surprised more than once at the responses I get when I say that we have the right to self-define all those terms used to define us. Further, I personally have a hard time swallowing the idea that a diagnostic rubric can categorize any human mind in any conclusive way. I am comfortable with my diagnosis now, because it’s been a decade and Time has shown me that it fits. But that rubric has failed me before. Different treatment methods have failed me before. And I largely blame myself for not being empowered to ask the questions I needed to ask. I didn’t advocate for myself. I didn’t interrogate when necessary. I trusted an authority that, at different times, either forgot to earn my trust or flat-out made up the reasons I should trust it. How many times in your path(s) of treatment have your practitioners reminded you that all the authority they have is that which you give them through your trust? This is the thought I kept having while reading this book: the audacity of believing a profession has some legitimate preexisting authority when it can honestly claim none. And still, sometimes, the world is confused when I ask the questions I ask today…and I’m afraid they are confused because they think my brain can’t be trusted. Honestly, they wonder, how can her brain know better than mine? The answer: Because I am in here. Thank you for this post; I’m going to have to read this book! I currently have too many other books to read at the moment, but hopefully after summer classes I’ll be able to read it! I just read On Being a Therapist by Kottler for a class; while it’s geared toward counseling students and professionals, it does discuss the ethical dilemmas we face as well as the insecurities of mental health professionals. I will check out the reading responses now. To what extent are we (the patients) complicit in allowing a profession we rely on to work toward its own self-preservation even if or when that need for validation conflicts with our best treatment? I think we’re very responsible for how we communicate with mental health professionals. I am done with dealing with doctors who misdaignose me or who want to talk to me in a condescending manner to retain their egotistic place of power above me and treat me like I am something lesser than they are. To me, if you are going to do something with my brain, it is going to happen when I give permission and after it has been explained well. So, here: Regardless of your chosen or recommended treatment methods, how many questions do you ask of your mental health professionals? How many questions do you ask of their responses? What kinds of answers to do you receive? To what extent are you satisfied with those answers? I will admit that sometimes I don’t ask enough questions. I have been on medications of some kind or another for over twenty years now. I am used to taking pills. Sometimes I don’t ask about the exact reasons they want me to go on a certain med, I just take the general reason and go with it, and sometimes I don’t ask enough about possible side effects. But I do try to ask about these things. I do ask if there are newer, better meds available than the ones I’m taking, which may have fewer side effects. Much of the time, the answers I receive are very minimal. So that is why I don’t ask as many questions now as I used to ask. I am sick of dealing with them looking at me and just brushing aside my concerns, which is what happens sometimes. I tend to do my own research on the meds, and that is an easier route than just trying to get the info from the doctor. But I do try to get the info from the doctor first, and if after I do my research, I don’t want to take a particular med, then I am not going to take it, and they will not be able to force me to do so as I am not a threat to myself or anyone else the majority of the time, so in that respect the law is on my side. I just got a psychiatric evaluation from the medical director of the community mental health center I go to the other day, since I’ve been going there for years and haven’t had one of those done since I first started. I meant to ask him, specifically, if he thinks I’ll ever be able to get totally off medication, but with all the discussion of my symptoms and the meds I forgot to ask this one crucial question, and I really want an answer to it. How many times in your path(s) of treatment have your practitioners reminded you that all the authority they have is that which you give them through your trust? Sadly, I don’t think I have ever had a doctor who was humble enough to remind me of that. Doctors are generally not very humble people when they’re dealing with “patients” who have mental illnesses. In my experience they are not likely to tell me that I don’t have to trust them. They are more likely to suggest that if I don’t trust them it’s because I’m paranoid or resisting treatment. Now, I do trust my doctor, but I have had those in the past who I didn’t have any reason to trust. And in any case, you should never put ALL your trust in your doctor and give up your own reason and your own logic and your own power over what happens to your own body and your individual brain. No one should give a doctor that much power. I think this is a missing component in the patient advocacy discussion — I think that too few people remember that advocacy must include patient empowerment and that (99.9% of the time) we really do know our brains better than anyone outside of them can. Jen- Thank you for sharing. First of all, maybe this is just a pet peeve of mine, but I hate that psychiatrists, and sometimes therapists, call us “patients.” In my program, we are taught to call people clients. When I get licensed, I plan to call everyone a client, as some people don’t appreciate the “patient” label. I also dislike that some mental health professionals thrive on their power. I recently read On Being a Therapist, and it mentions the “bad” reasons for becoming a therapist, counselor, psychiatrist, what have you, and power is one of them! Although I’m not familiar with schizoaffective all that much, as I’m diagnosed with bipolar disorder, I’m okay with the fact that I’ll probably be on meds for the rest of my life. I’d love to decrease doses when I can, and maybe get off the meds, but I’m okay with the meds. I know with bipolar disorder, when people are fine or manic, they think they are better and go off their meds, but inevitably, we come crashing down again. It will be interesting to see what I do when I get pregnant. I’ll probably have to stop my meds, but that’s a completely different story! I wholeheartedly agree with the idea of not putting all your trust in your doctor. You need to have some trust in order to have a good relationship, but I admire the fact that you still use your logic and reason. Asking the hard questions is good. I wish you luck asking about the medications and other questions. I am not a client of my doctors. I have clients in my business but I am performing work for them. I am not helping them heal. If you call everyone a client, you may be offending those who would rather be called patients, those like myself. You make a really good point. I’m glad you brought it up, as I wouldn’t want to offend one of my patients that would rather be called a patient. Thanks. ∃- After reading what you wrote here, I am interested in reading this book. I’m a little hesitent to read Anatomy of an Epidemic, only because I don’t want to get into a stress crisis over the fact that I’m stuck taking this meds for life, most likely, and I feel that if I read that book it would make me want to go off them. I know that it would be nice to go off them, but at the same time, I know what my life was like without them, and I would not survive long that way again. I do think I will end up reading it, for the information and to stay up on the recent trend in writings on mental illness, but I do tend to think that, from what I have heard about the book, it paints and awfully broad stroke against all medications and I’m not sure I want to read it for that reason. I have to agree with the description of Anatomy of an Epidemic that says it paints with a broad stroke. I found it to be a very frustrating read, often raising many questions it seemed to refuse to answer. On the other hand, Carlat’s book is very different. It acknowledges many problems in psychiatry, but does not throw the baby out with the bathwater. It’s written by a psychiatrist who wants to be a BETTER psychiatrist. I can’t say my questions here were raised directly by the book…but were rather the questions I came up with after thinking for quite a while on some of the things raised by the book. I agree with you, Jen, that reading that book may put you in a foul mood regarding meds. It definitely opened my eyes to some things and I am trying to get off one drug that is not meant to be long-term at all. I would not read it if I were you Jen. It’s not worth it. It’s a slammer agenda journalist, nonscientific book. I asked a lot of questions in the beginning. I was given research articles and books to read. I was involved in the medication discussion and made choices based on what I knew (which, I thought, was everything). Since psychiatrists don’t know everything, I hardly see the point in continuing to ask questions in my 30-minute spot. I let her ask the questions. I get my information from Twitter where all these great people post research articles on things like how Bipolar IIs are more cognitively deficient than Bipolar Is. But at least the info is out there.